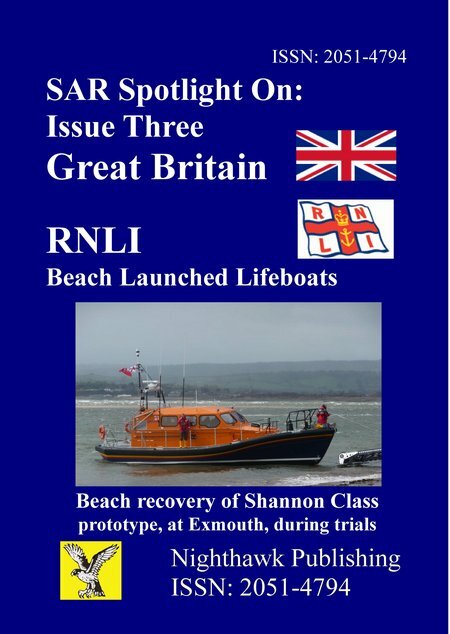 The third issue of this new serial publication reviewed the Royal National Lifeboat Institute beach-launched all-weather lifeboats and the introduction of the new Shannon Class ALB. This review includes the RNLI Headquarters and the new ALB factor that is being built on the Headquarters site. In addition a review of the Shannon Class and its launching system, the Mersey Class, which is being replaced by the Shannon, is reviewed together with its launching system. The first two Lifeboat stations to received the Shannon during 2013 are covered together with the Aldeburgh station that has yet to be listed to have its Mersey Class replaced by the Shannon. DESCRIPTION: The series is dedicated to Search And Rescue internationally, across the range of SAR services and including the treatment and rehabilitation of rescued casualties. The third issue of this new serial publication reviewed the Royal National Lifeboat Institute beach-launched all-weather lifeboats and the introduction of the new Shannon Class ALB. This review includes the RNLI Headquarters and the new ALB factor that is being built on the Headquarters site. In addition a review of the Shannon Class and its launching system, the Mersey Class, which is being replaced by the Shannon, is reviewed together with its launching system. The first two Lifeboat stations to received the Shannon during 2013 are covered together with the Aldeburgh station that has yet to be listed to have its Mersey Class replaced by the Shannon. The eMagazine achieved a high level of illustration with colour photographs and maps.